Manu Samoa forwards Josh Tyrell and Piula Faʻasalele are in doubt for this Sunday’s (Samoan time) Rugby World Cup qualifier against Germany. Doncaster Knights lock Tyrell and Toulouse flanker Faʻasalele both started in the 66-15 first leg victory in Apia. Head coach Fuimaono Titimaea Tafua told Radio New Zealand the pair suffered the injuries during a training camp in England at the end of last week. "Our physio and the doctor are still working trying to get them back soon," he said. 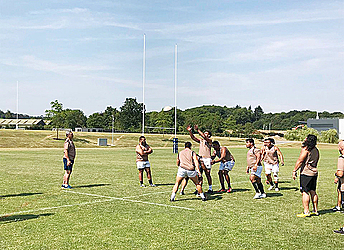 The full Samoan squad, including a few late arrivals from New Zealand, landed in Germany on Tuesday after spending five days training in Guilford, south of London, ahead of the second leg match in Heidelberg, Germany. Fuimaono said the first leg victory was a welcome result after nine consecutive test defeats. "It is very good for our country and also our supporters, especially our families as well - the players' families - they've been praying for the team. "It's a very good opportunity for our rugby because we really want to go to the World Cup next year so I think after the game on Saturday the pressure will ease off from us." Prime Minister, Tuilaepa Sailele Malielegaoi, who is also the Chair of the Samoa Rugby Union, accused the players of lacking guts in the lead-up to the match in Apia but Fuimaono insisted the comments had a positive effect on the team. "It's very good for our players as well. It's very good motivation for our players...there's no problem at all between us and our Prime Minister, which is (also) our Chairman," he said. The winner of the home and away playoff will qualify for next year's World Cup in Japan, joining the host nation, Ireland, Scotland and Russia in Pool A. In a report from Team Manager, Vaaelua Aloi Alesana, he said the team is in good spirits. “The team had its first training on Monday and everyone is training well except for a couple of players who are recovering from minor injuries. “The weather is similar to Samoa except it is dry heat here in Germany. “A few of the boys’ relatives have visited us at the hotel and it is anticipated that we will have several supporters for our team here in Germany. The starting team will be named tomorrow. Venue: Fritz Grunebaum Sports Park, Heidelberg.